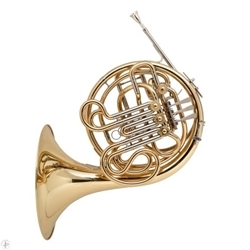 The JP164 is a Kruspe style student to mid range double french horn ideal for those looking for an affordable Bb/F double. The instrument is freeblowing across the entire range and comes in an attractive lacquer finish. The adjustable finger hook and ducks foot makes it ideal to suit any size hands including younger players. The instrument also features a Bb/F thumb valve which can be easily reversed for those who prefer F/Bb. Comes supplied with a mouthpiece and lightweight case.